appy New Year! There is always a flurry of activity around the beginning of the year. Resolutions, goals, intentions, new things to try, old things to toss. 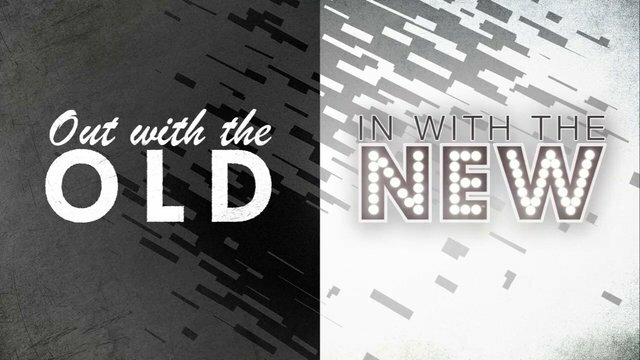 One of the big new things to embrace? 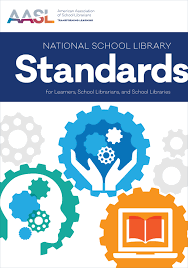 The new National School Library Standards for Learners, School Librarians, and School Libraries. Have you bought your copy yet? Are you excited, or hoping it will go away? (HINT: Go for the former. The latter isn’t happening.) I blogged about this change back in September (the post is here and gives you several links to help you start), and since then I’ve heard about them at the AASL conference in November and started using them. It is a change I am definitely excited about. Many of you have been put off by the price tag of $199 if you are not a member of ALA. Even the cost of $99 to ALA/AASL members has caused some gasps. But recognize, these will be our standards for the next ten years. You may as well bite the bullet and get started. If memory serves the old standards, Empowering Learners: Guidelines for School Library Media Programs, cost about $45, but it but had only 64 pages! The new standards comes in at a hefty 314p. That’s almost five times the size – so it’s practically a bargain! Personally, I have been immersing myself in the National School Library Standards in order to update an online course I’m teaching starting January 17. Since it’s a course text, I had to re-do much of the syllabus, rewrite sections of my lectures, and change topics for discussion as I figured out how to introduce my students to the standards. The task of wading into these new standards seemed enormous at first. It’s such a big book and there didn’t seem to be any parallels between old and new standards which would have allowed me to simply insert new page numbers. It was intimidating, but I am so glad I couldn’t put it off. The more I explore the Standards, the more I find to like. I like the idea that there are three Frameworks: one for learners, one for school librarians, and one for school libraries. All three have the same structure so you can see how the same Domains (Think, Create, Share, Grow) and Shared Foundations connect. It is simple to compare them and once you have familiarity with one Framework, you can easily grasp the others. 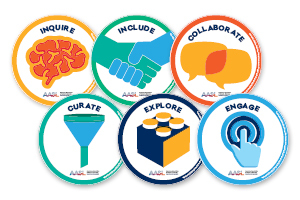 Most likely you will want to begin with the AASL Framework for Learners. It’s a free download and only eight pages so not having ordered the larger book it is no excuse for not getting started. We all are learners and more than ever we need to focus on our own learning. Spend time with the centerfold that lays out the standards for learners. Read the Key Commitments for each of the six Shared Foundations. You will find your old lessons almost always included aspect of the four : (1) Inquire, (3) Collaborate, (4) Curate, and (5) Explore. Your lessons may not have incorporated Include and Engage but you now should give these two serious consideration Include (the fourth Shared Foundation) articulates the need to incorporate diversity and global citizenship into student learning opportunities. Engage (6) focuses on the ethical use of information. Both have been components of your practice, but the six Shared Foundations keep them in front of you. This is not to say you need to include all six Shared Foundation and all four Domains in one unit, but in constructing your units, you should see which ones fit best. Check the AASL portal for the Standards regularly. 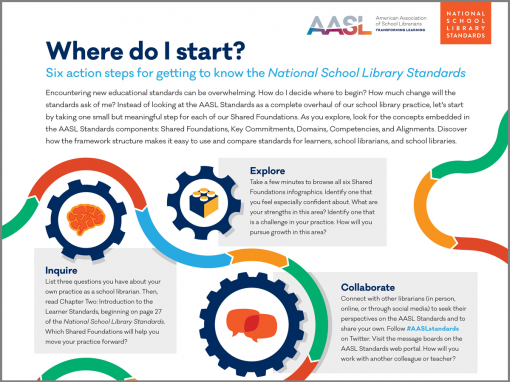 If you “enter” as School Librarians, you will find resources to support you in getting started with the new National Standards for School Libraries. New ones are added frequently. Once you have your copy of the Standards, I recommend How Do I Read the Standards? It boils down how the six Shared Foundations and four Domains combine within the three Frameworks, defining the competencies we want to achieve. In addition, it explains how to identify which of the Shared Foundations and Domains you are using in a lesson. All this in a one-page (free!) infographic. Do check the Professional Development AASL is offering. Upcoming events as well as archived ones are available. Choose one and get started. It is a new year and we have new standards. It’s a bit scary, but it’s also exciting to be here as we truly take our profession and practice into the future. Thank you, Hilda, for this wonderful write-up! I’ve been staring at the new NSLS book on my desk for a couple weeks, not knowing how to jump in, and you’ve given me a step-by-step approach that doesn’t seem so daunting. You are so very welcome. This was exactly what I hoped to offer!